Ice and Ice Cream in Hawaii, 1869. 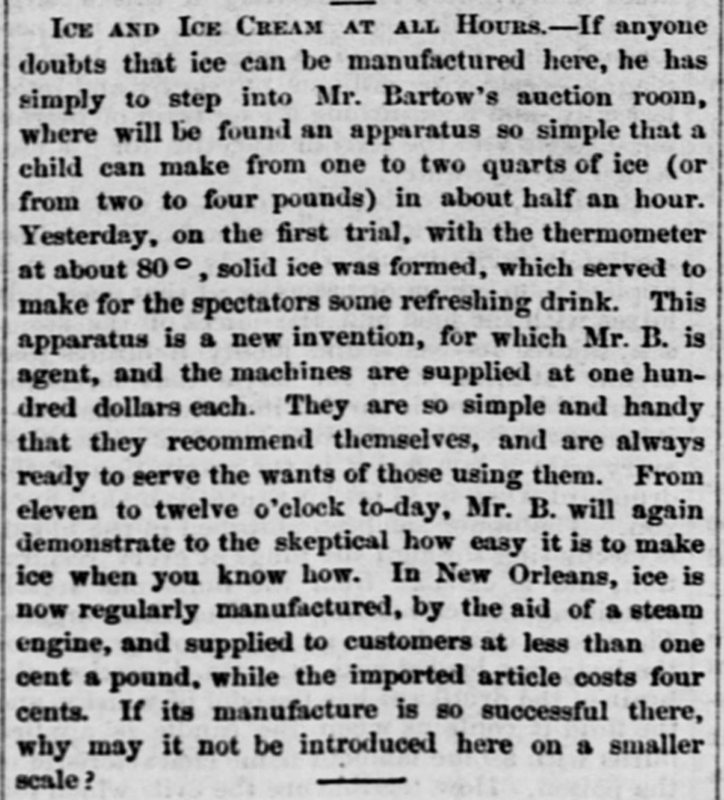 Ice and Ice Cream at all Hours.—If anyone doubts that ice can be manufactured here, he has simply to step into Mr. Bartow’s auction room, where will be found an apparatus so simple that a child can make from one to two quarts of ice (or from two to four pounds) in about half an hour. Yesterday, on the first trial, with the thermometer at about 80°, solid ice was formed, which served to make for the spectators some refreshing drink. This apparatus is a new invention, for which Mr. B. is agent, and the machines are supplied at one hundred dollars each. They are so simple and handy that they recommend themselves, and are always ready to serve the wants of those using them. From eleven to twelve o’clock to-day, Mr. B. will again demonstrate to the skeptical how easy it is to make ice when you know how. In New Orleans, ice is now regularly manufactured, by the aid of a steam engine, and supplied to customers at less than one cent a pound, while the imported article costs four cents. If its manufacture is so successful there, why may it not be introduced here on a smaller scale? The Pacific Commercial Advertiser, Volume XIV, Number 3, Page 3. July 17, 1869.